All area rugs whether machine made, hand woven, large or small will last longer and retain value if properly cleaned and cared for. 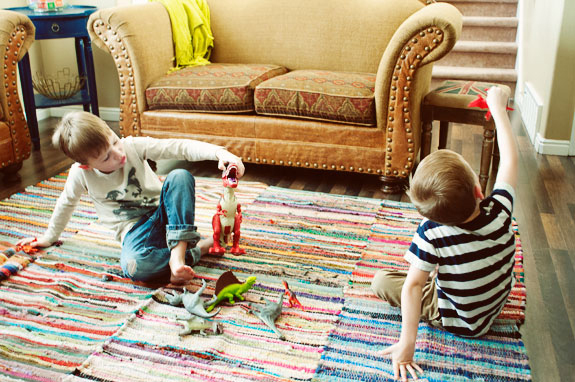 Protective sprays sold and professionally applied will protect a rug from soaking spills into the fibers. Most all carpets today are manufactured with a protector on them from the factory. Carpet protector is a chemical applied to the carpet that affects the surface fibers of the carpet so that the carpet will stay cleaner longer. It is generally sprayed down after the carpet is cleaned and groomed into the carpet and allowed to dry. Technology has also allowed for carpet protectors to be co-applied with cleaning solutions for a more consistent application. A carpet protector does four things. It helps to repel liquid, resist dry soil from scratching the fiber, resist spills or spots from becoming stains, and improve the cleaning ability of the fiber so that it stays cleaner longer. An unprotected area rug is more susceptible to permanent wear and staining. There are four main types of area rug and carpet protectors available for application. First are fluorochemicals which generally have the best soil resistance, water & oil repellency, and stain resistance. Silicas and acrylic polymers are not very effective for soil resistance or stain repellency. Then there are silicones which have poor soil resistance, great water repellency and very little oil repellency. Silicone has a tendency to cause rapid re-soiling to the carpet fibers. Lastly, there are phenolic chemicals which are good for stain resistance but not designed for repelling water or oils transfer. This is the reason phenolic chemicals are paired with a fluorochemical which is used most in the carpet cleaning industry. For any carpet or area rug maintenance contact us at 951-787-8787 serving Riverside, CA and surrounding areas.